U.S. Republican Sen. Lindsey Graham arrived in Turkey on Friday for meetings with top officials, including President Recep Tayyip Erdoğan and Foreign Minister Mevlüt Çavuşoğlu. 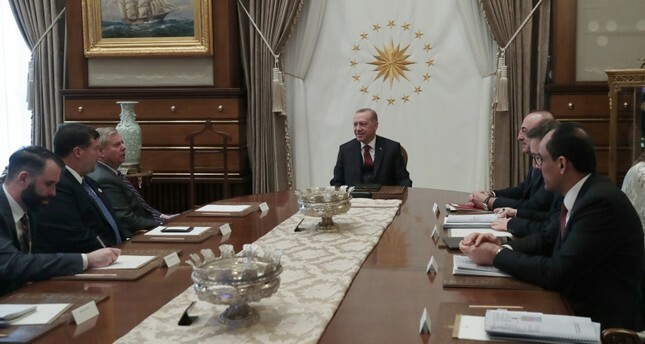 In both meetings, Erdoğan and Çavuşoğlu discussed with Graham the murder of Saudi dissident journalist Jamal Khashoggi and the U.S. decision to withdraw from Syria. Despite being known as a loyal supporter of U.S. President Donald Trump, unlike the president himself, Graham has been a fierce critic of Saudi Crown Prince Mohammed Bin Salman (MBS) after Khashoggi's brutal killing in the Saudi Consulate in Istanbul two months ago and pioneering initiations to punish the Kingdom as no satisfactory result has been yielded yet in the prosecution process. Khashoggi, who had lived for a time in the United States and wrote for The Washington Post, had been critical of the Saudi regime. He was killed in what U.S. officials have described as an elaborate plot, as he visited the consulate for marriage paperwork. U.S. intelligence officials have concluded that the crown prince must have at least known of the plot, but Trump has been reluctant to pin the blame. After a meeting with CIA Director Gina Haspel last December, Graham said there is "zero chance" the Saudi crown prince wasn't involved in Khashoggi's death. "There's not a smoking gun. There's a smoking saw," Graham said, referring to Secretary of Defense James Mattis' words that there was "no smoking gun" implicating crown prince and reports from the Turkish government that said Saudi agents used a bone saw to dismember Khashoggi after he was killed in the Saudi consulate in Istanbul. The Republican senator has also been an outspoken critic of Trump's decision to pull U.S. troops out of Syria and said that the withdrawal should be done "in a smart way." Despite the fact that he referred to terrorists of the PKK's Syrian affiliate People's Protection Units (YPG) as U.S. allies, he forced former Secretary of Defense Ash Carter to accept that the PKK and the YPG were aligned in April 2016. "Yes," replied former Secretary of Defense Carter when Graham asked whether he believed the YPG is "aligned or at least has substantial ties to the PKK." The U.S. recognizes the PKK as a terrorist organization; however, it supports its Syrian affiliate, the YPG, under the pretext of fighting against Daesh, despite the strong links between the groups.